Parker, Smith & Feek Account Executive and Management Liability Practice Director Michael Edmonds is featured on Portland Radio Project’s latest Cybercast Oregon episode Online Reputation. 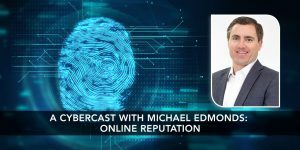 Michael shares how to handle professional and privacy liability exposures to keep your business’s online reputation from a reputation-damaging cyber attack. With a continual stream of media and headlines warning against system weaknesses, data breaches, information theft, and cyber attacks, it is important to understand what online reputation management is and the defensive measures available against these threats. As the threat landscape grows increasingly more sophisticated and tests our defenses, it is essential to understand how to recover from a potentially damaging cyber security threat and learn practical, effective steps to keep your business safe and alert to prevent a future attack. Cybercast Oregon is a podcast about the ins-and-outs of technology security, explored through personal stories, how-to-guides, and expert advice airing the third Friday of every month 2pm-3pm on PRP.fm. It is hosted by Kedma Ough, director at Mt. Hood Community College’s SBDC.